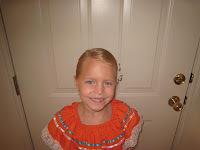 This one is pretty much the same as this one, but it isn't braided. 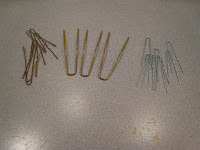 And since it isn't braided, I use a different hair pin. But I only use one (the initial pin down) since the bun is so low, and the hair pin is so big, I don't want to hurt her head. 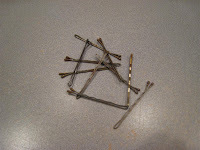 But, I use two more little ones to make sure it stays. 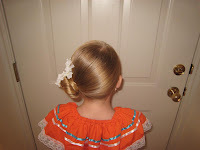 note: I also use these hairpins when we do a regular bun on the back of her head for ballet, weather it is braided or not. They really do make the perfect bun. I got them at a dance wear shop. 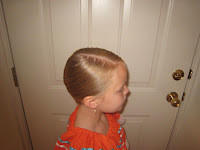 I twist the ponytail while I am wrapping it around the ponytail holder, when I get it wrapped all the way around I use the one big hair pin in the area where the most hair is (this will probably hold it, but...) then I make sure it is completely secure with two little ones. 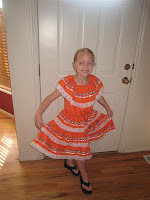 Today Piper wore her Mexican dress (our last name is Salazar!) 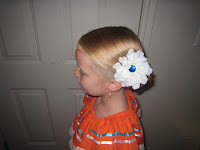 and she said that she had seen Mexican dancers wear their hair in a low bun with a flower, so that is what we did.